With sales towering over contesting genres and anime adaptations making up 90% of Western exports, shônen manga are the most popular form of Japanese comics, avidly enjoyed by most even though, as its name indicates (shônen: boy/youth), its key demographic are typically teenage boys between the age of 12-18. Victims of their own popularity though, shônen stories have become infamous for their cookie cutter narrative tropes and stock heroes with every freshly released series and adaptation competing with one another on similar fighting grounds. With battle shônen giants such as Naruto, Bleach and One Piece casting shadows over potential contenders, how does an archetype action series like My Hero Academia strive all the while using every shônen trick in the book? 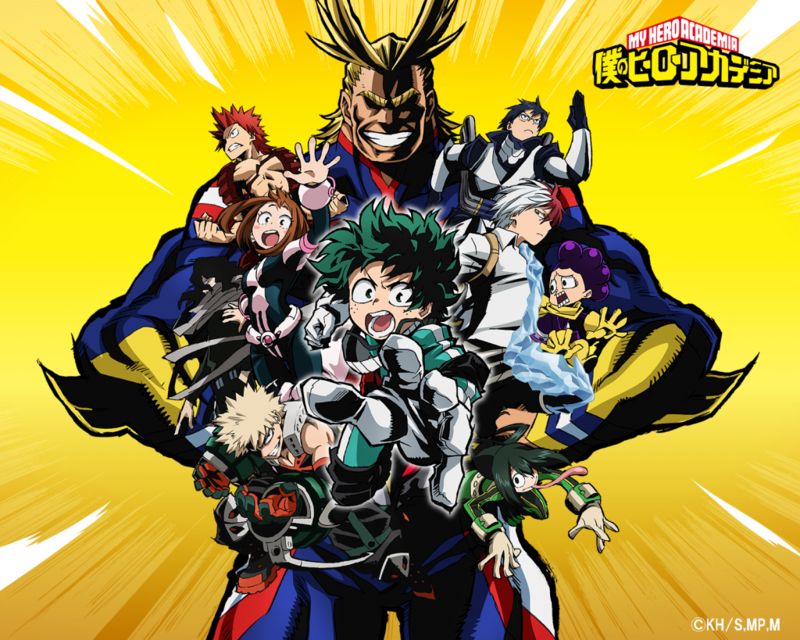 Written and illustrated by Kôhei Horishoki, Boku No Hero Academia (or HeroAca for short) has been serialized in Japan’s number one bestselling manga magazine, Weekly Shônen Jump since 2014 with a worldwide ongoing successful anime adaptation by studio Bones in 2016 making it one of the fastest growing successful mangas of the 2010s. Prestige aside, being published in one of the most prominent and long lived magazines of all time has its downfalls with constant popularity contests in an already saturated sea of releases and relentless demands for eye-catching content all the while adhering to the unspoken guidelines set by previous trail blazers that have made Jump Magazine what it is today. With most worldwide bestselling manga originating from Weekly Shônen Jump though, making it long term in the magazine’s rankings has become a skill and an art form any aspiring author strives to master. HeroAca makes no exception. In fact, the way HeroAca seems to mould itself into the typical shônen standards, repossessing characteristics and using them to its own advantage is what takes the series to the next level and what makes it shine in the midst of carbon copies and stereotypical plotlines. From deranged levels of competitiveness to ostentatiously yelling attack names, battle shônen series are characterised by being high in action and comedic while hosting a select array of characters easily recognisable as: the hero, the antagonist, the rival, the sidekick and the love interest, with each character’s level of variation just a different branch off of the same tree. The hero, usually a young male, is the portal between the readers ‘reality and the series’ universe, his relatable personality designed to carry the core theme of the story all the while unveiling wholesome values for the series’ young audience to look up to. Usually average if not mediocre, the hero seeks perfection in bettering himself as well as a distinct set of skills through persistence and steely determination, making his uphill journey as exciting as it is meaningful. From the same pool carbon copy heroes are selected from, multiple varieties of stock key characters such as rivals and sidekicks are made available to choose from, turning shônen manga narratives into true blends of pick and mix fixings, issued by a limited buffet of stereotypes where endless amounts of combinations seem to exist, only to have most of them already tried out and tested over time making true originality complicated and difficult to recognise. Where My Hero Academia strives is in its ability to pocket these mandatory stereotypes and using them as foundation for the story. Where originality has become blurry, HeroAca uses what has already been known and used for decades to establish a solid narrative upon which unravelling events can rest and grow, making for a steady and secure storyline. With overused clichés in hindsight, shônen manga tropes become a playground to experiment upon. Boku No Hero Academia follows the story of young Isuzu Midoriya, a boy born without powers (quirks) in a Superhero dominating world where holders of the most interesting and powerful quirks inspire awe and prestige and are first in line to be trained to become licensed Heroes through renowned academies. Thought taunted and antagonised for being ‘quirkless’, Midoriya aspires to be a true hero, inspired by his childhood favourite champion All Might as he attempts to enter the most prestigious hero academy of them all: UA high school. Eagerly displaying premises for a typical shônen manga hero, Midoriya is presented as being ordinary and weaker than his peers, following more shônen guidelines as he dreams of becoming something bigger than himself. Where the series strikes gold is with its intelligent character building by introducing an innately relatable protagonist from the start, mediocre in his own setting but made to the image of most readers: ordinary humans in an everyday world. Midoriya mirrors his audience as he begins his journey at square one without any special skill or aptitudes, instantly gaining trust and empathy throughout a series of demonstrating events which highlights the manga’s confidence in its ‘show don’t tell’ abilities. If Midoriya is the perfect representation of a shônen cookie cutter hero, My Hero Academia manages to take that definition and make it meaningful, reinforcing the trope by bringing clever reasoning into it, resulting in engaging well-rounded characters with personalities now supported by these freshly redefined shônen standards. As the series advances, every stock character, hero or villain, is skilfully polished to be made three dimensional though born from shônen criteria, tugging at the rules while keeping them in place. Every element is made to tell a story reinforcing either character or world building, ultimately weaving a structured narrative web around the series’ core shônen themes. 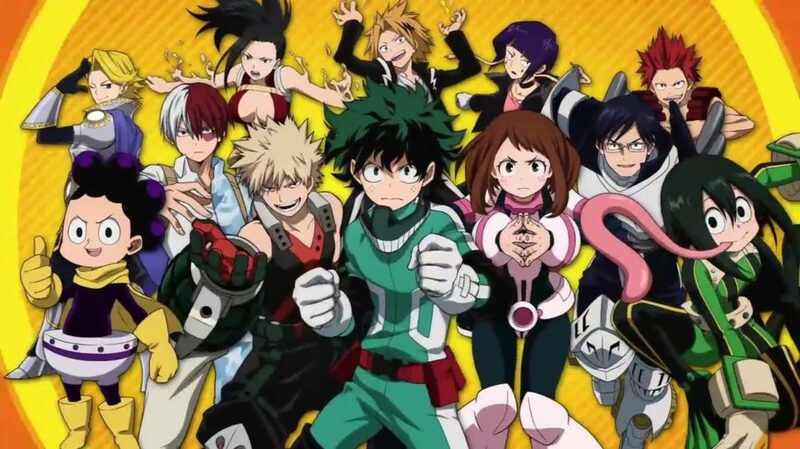 Though made to look like a battle shônen series, Boku No Hero Academia is first and foremost a character driven story that uses competitive fighting through training and tournament arcs as a means to an end. Where typical shônen manga use action for the sake of action using skilful animation and cutting edge choreography for a nail biting fight scene, HeroAca continues its psychological power play by using key events such as battle face offs to instigate more depth into leading characters, once again resolving to using battle shônen labels to its advantage. Instead of focusing on the action and making fight scenes a priority, HeroAca finds ways to make every morsel of action meaningful, not wasting one second inside a sequence, filling entire scenes with intensity as well as information that help build characters and thicken plots regardless of the fight’s final outcome. Though not as shiny as others when it comes to action scenes, the series triumphs at raising intensity having knowingly taken the right amount of time to set the stage, getting readers invested in competing characters and leaving them on edge as the heroes face off as equals having had the same amount of time in the spotlight. With every restricting shônen guideline thrown into the mix, Boku No Hero Academia makes it its own, dusting it off and making it relevant to the plot, from cookie cutter characters to lacklustre mandatory arcs, new definitions and meanings are made from the same original essence. Shônen manga are the same age old stories about growing up, overcoming adversity through wholesome values and the power of friendship, each new version in its own tone and setting. With rigid standards put into place over the years, it’s difficult to see how the sky is the limit when it comes to storytelling with an audience that expects to see both refreshing content and what they’ve grown to know as shônen manga over time which is even more true for series issued in trade name collectives such as the Shônen Jump family. With new releases enjoyed but quickly forgotten, it’s become impossible to compete against already established series let alone ongoing similarities with overlapping story patterns and themes, which is what makes My Hero Academia such an oddity as it manages to stick out all the while outwardly representing every aspect of a shônen manga in surface. Redefining old standards though and giving them new meaning as foundation for a story of epic proportion is what makes the series memorable as it brings authenticity to the table through deep, three dimensional characters and strategically placed insightful events all aimed to take the story to the next chapter with readers eagerly in tow. Taking its time to construct and deconstruct what makes a good shônen series, HeroAca appears to have its finger on the perfect recipe for a successful modern day shônen manga. This entry was posted in ANIME and tagged anime, anime adaptation, bakugo, battle anime, battle manga, boku no hero academia, breaking the rules, cookie cutter shonen, heroaca, heroaca news, isuzu midoriya, jump, kohei horishoki, Manga, my hero academia, popular shonen, shonen, shonen anime, shonen jump, shonen manga, shounen, todoroki, trypical shonen tropes, typical shonen, weekly shonen jump, what is a shonen. Bookmark the permalink.